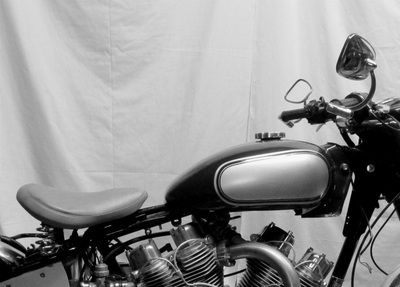 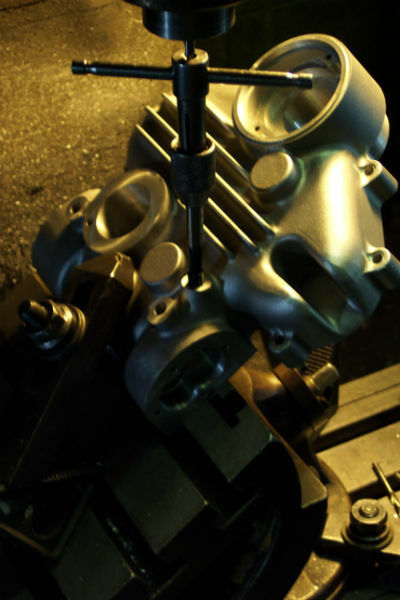 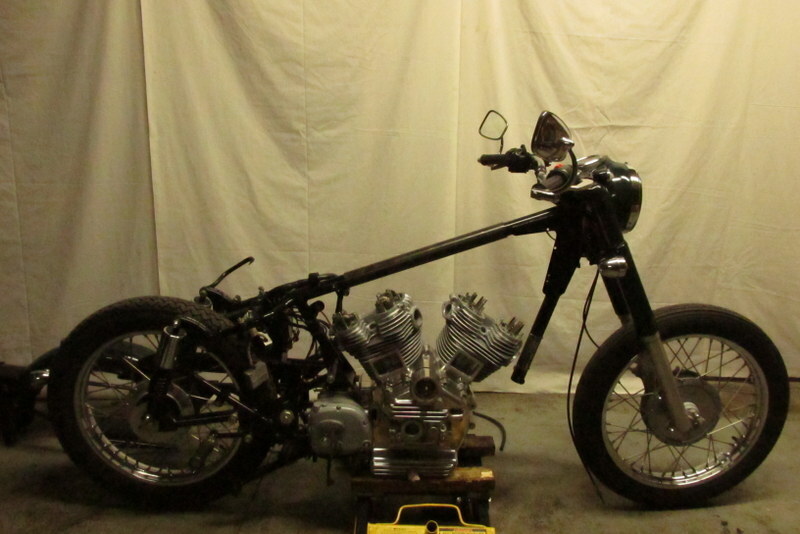 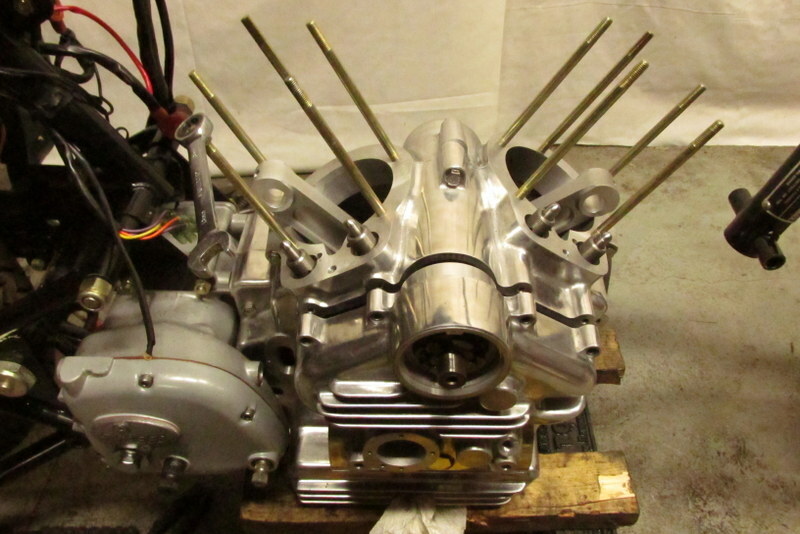 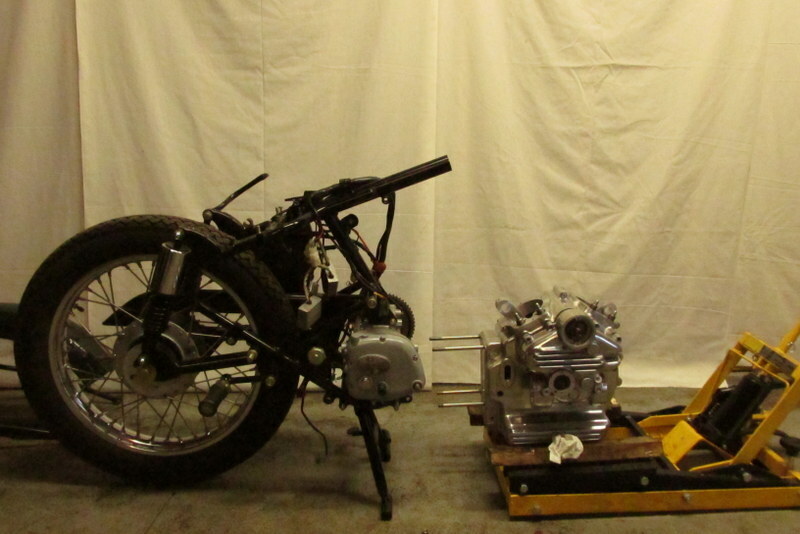 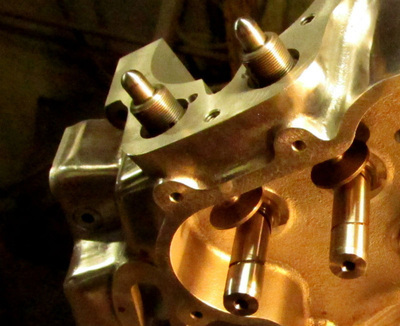 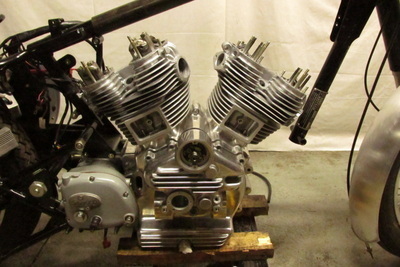 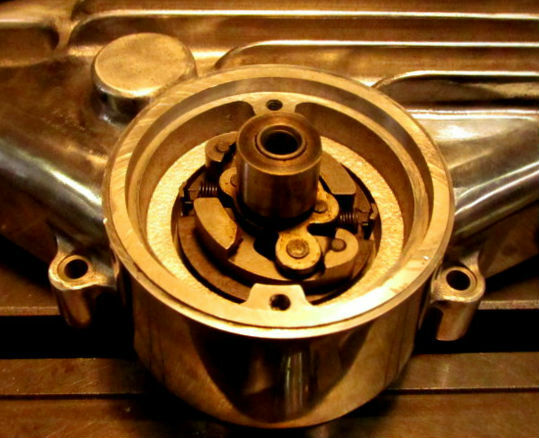 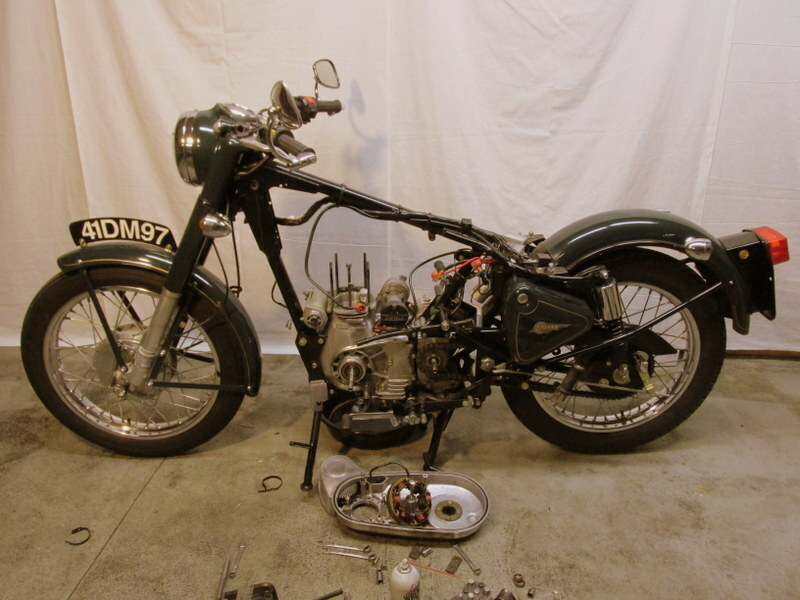 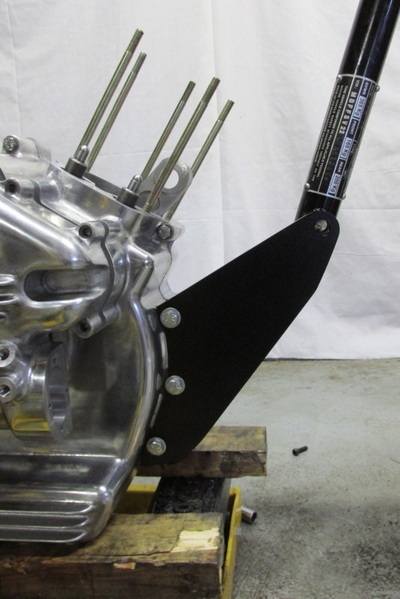 Beginning with a bone-stock 500 Bullet, here are most of the key stages in the build process. 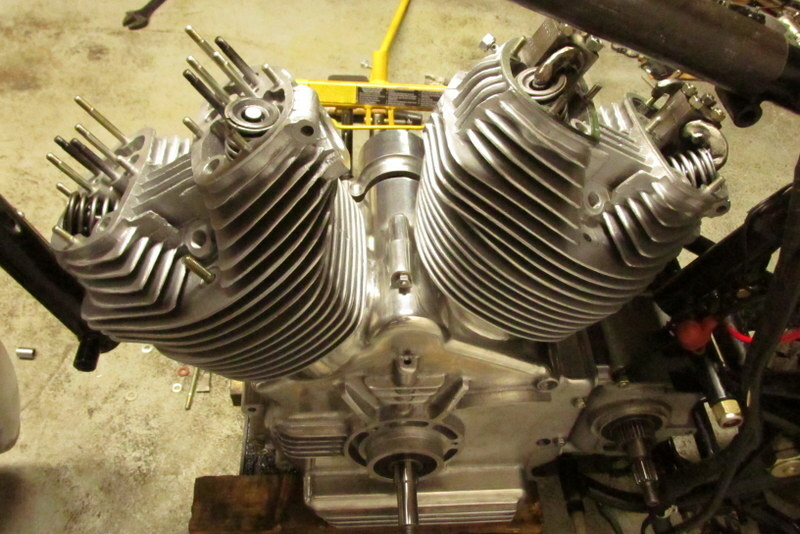 Images are from both 1120 and 998 machines. 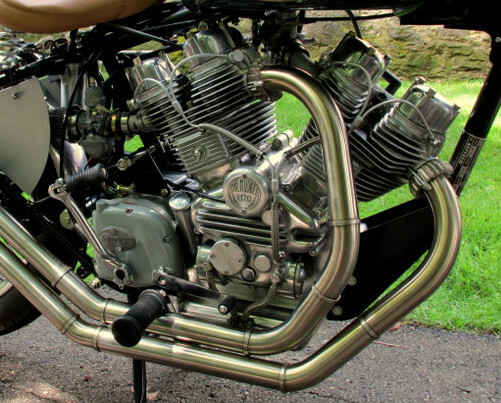 Roll over images for captions. Click on image for larger size. 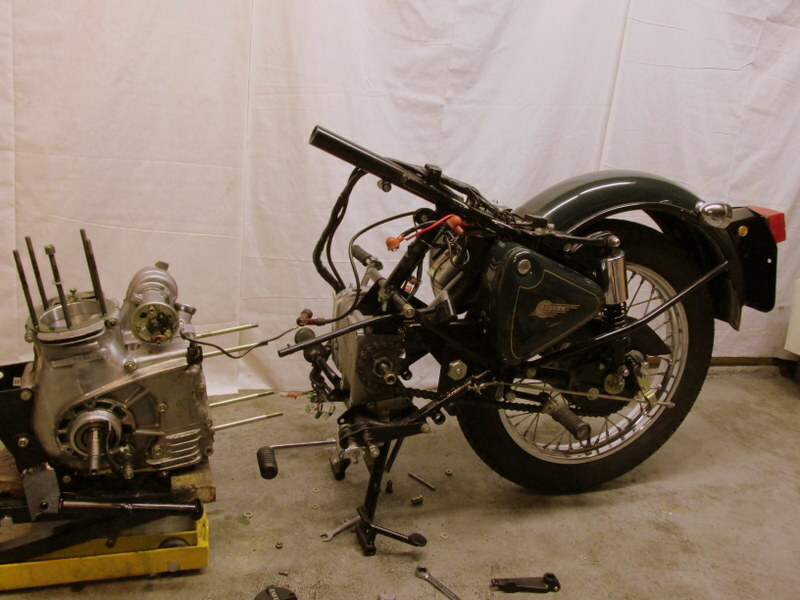 Tank, seat, exhaust, carb off. 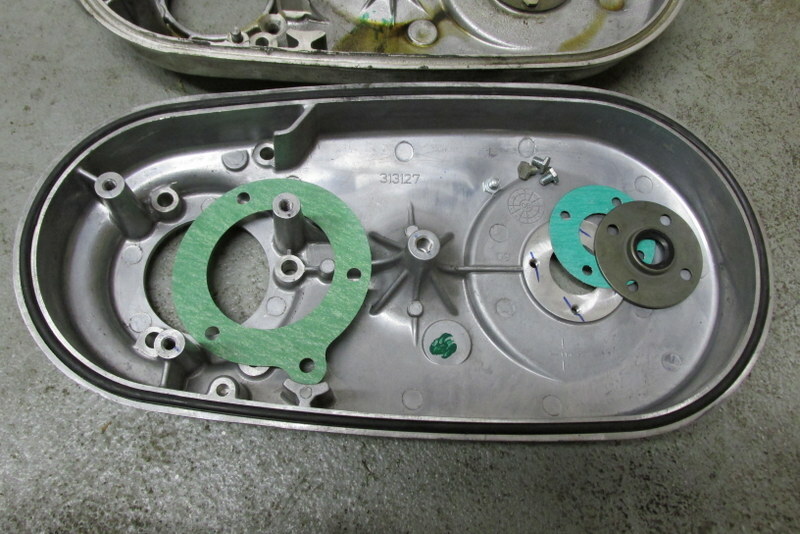 Clutch, primary drive, inner primary off. 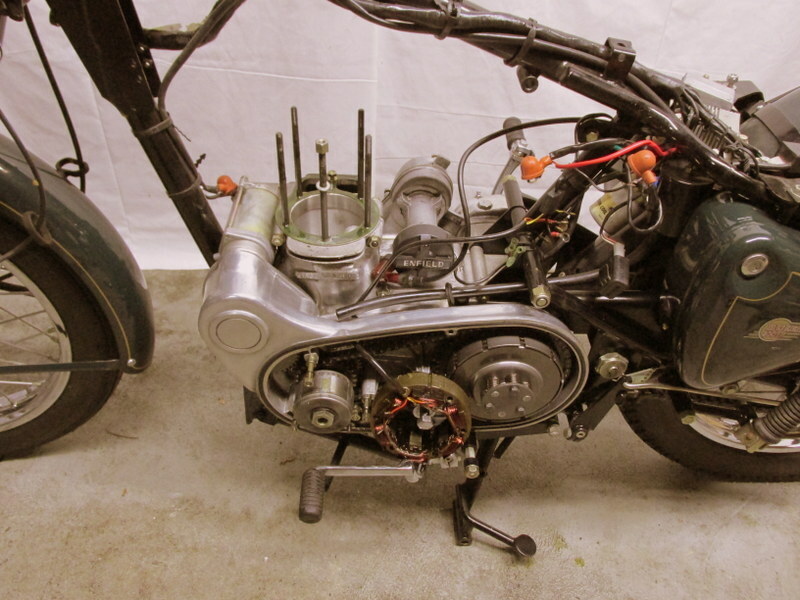 Wiring harness disengaged, engine plate stud off, entire front end can be rolled away. 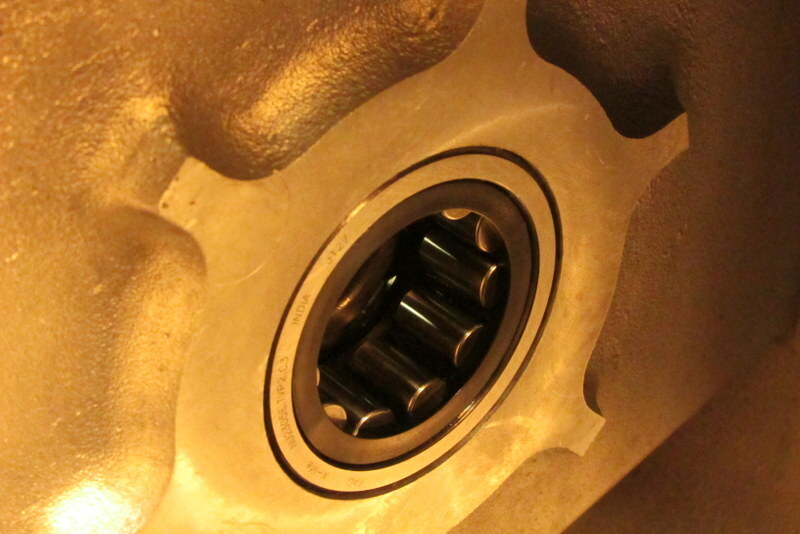 Gearbox stud nuts off, crankcase can be removed. 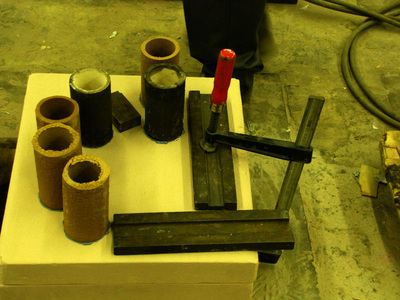 Original Musket hardwood casting patterns, used for castings. 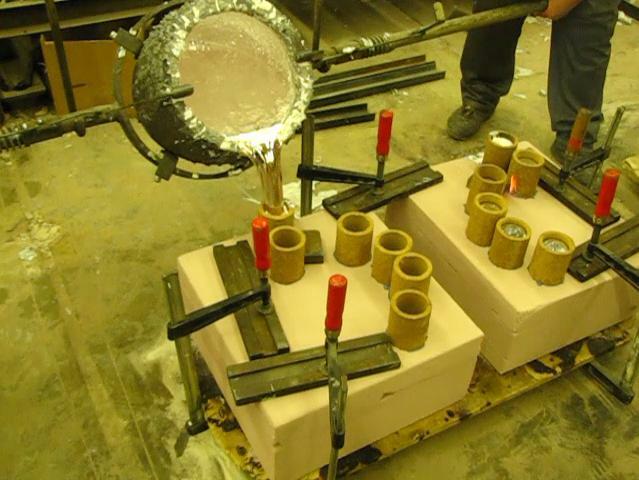 Left half pattern at foundry, ready for molding. 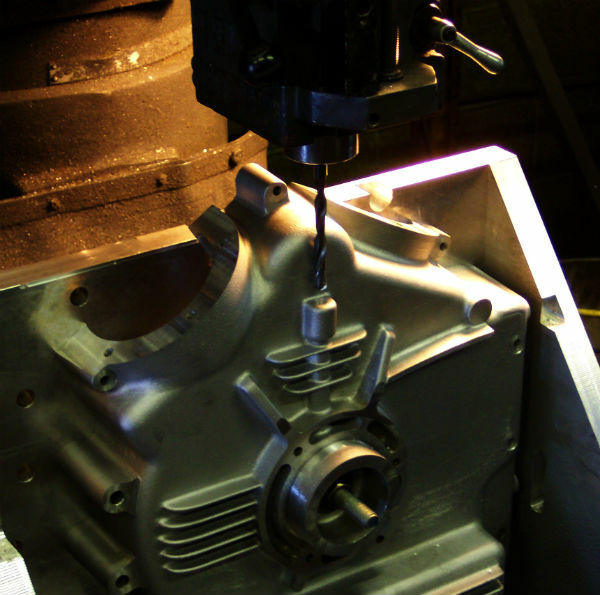 Same process for all. 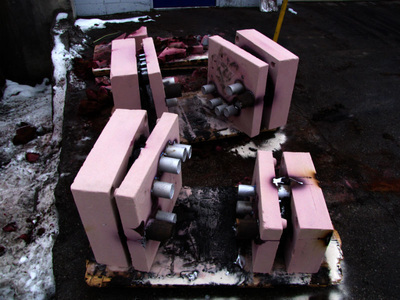 Sand mixer drops sand, mold packed and struck off flat. 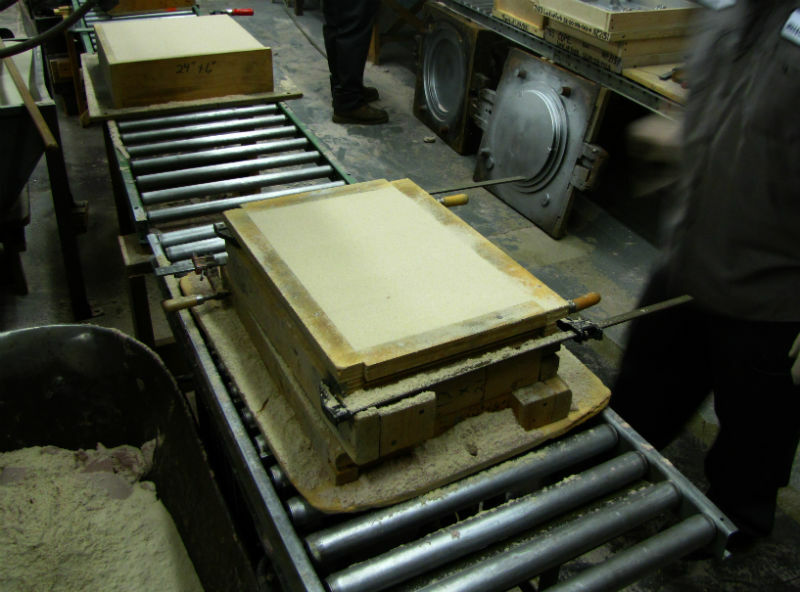 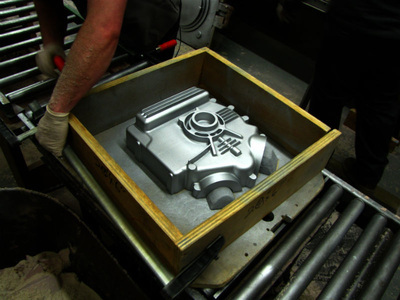 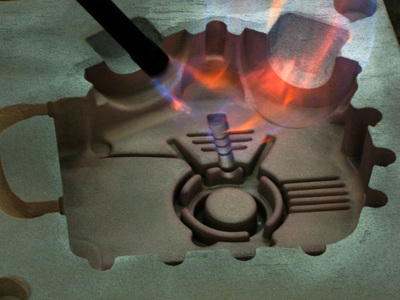 Flame curing sand mold for max. hardness. Complete mold ready for metal. 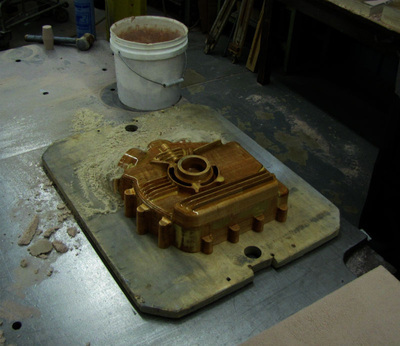 Cooled, down, molds broken apart. 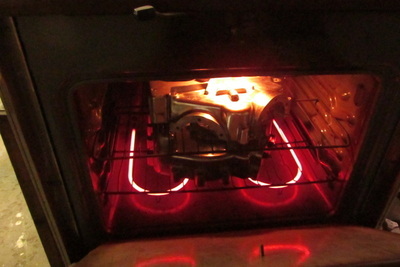 Casting emerges. Same process for all three castings. 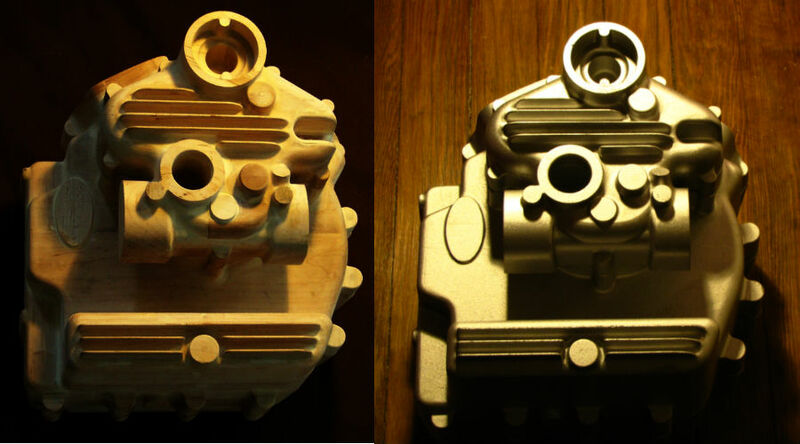 From wood to metal, shotblasted, ready for machining. Both case mating surfaces faced, drilled, bored, reamed. 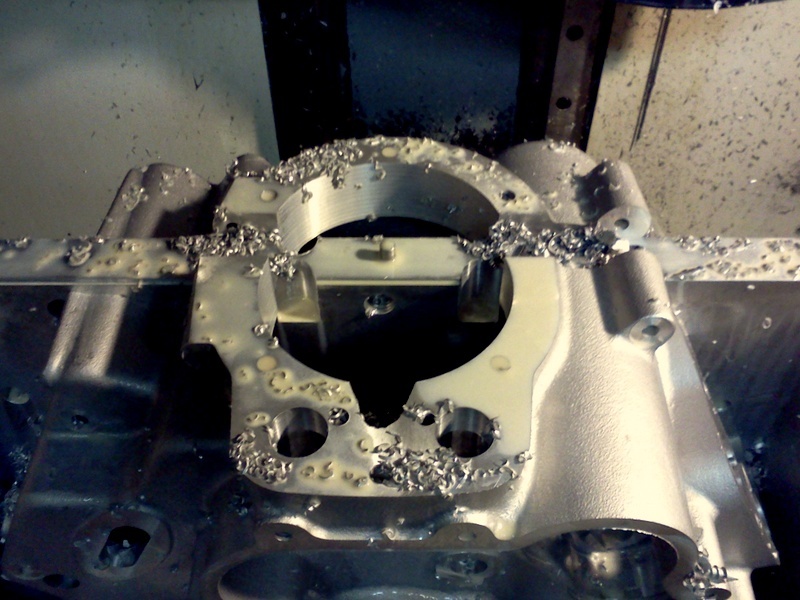 Flipped left case half machined for clutch mating surfaces. Flipped right case half machined. 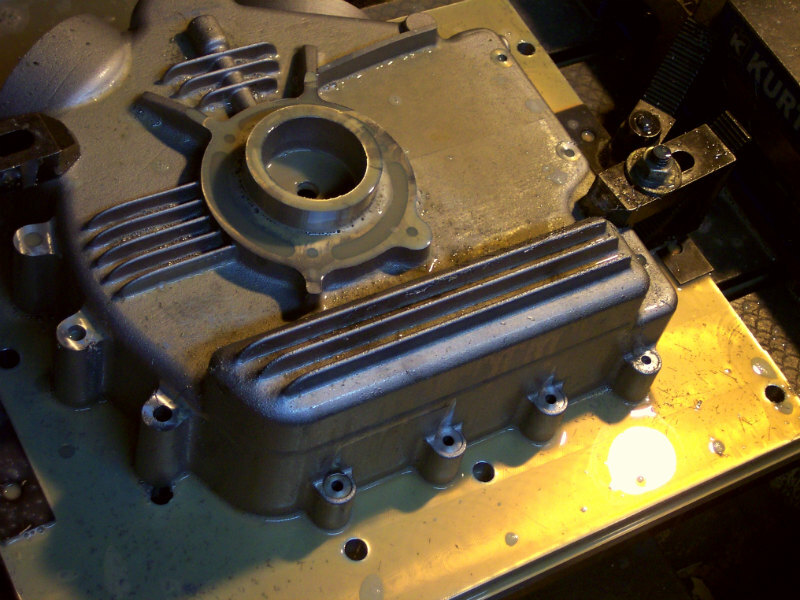 Camchest drilled, reamed for spindles, timing shaft. Oil filler neck mating surface. 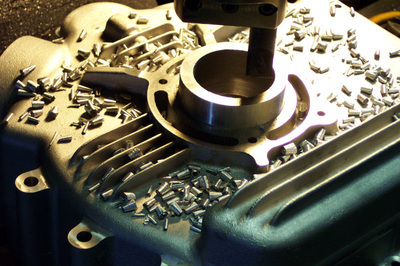 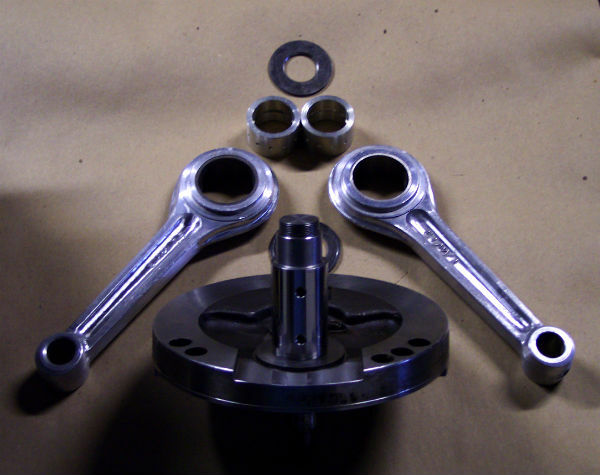 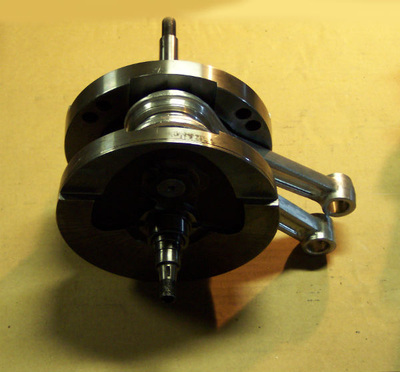 Camcover- facing, drilling, reaming spindle bosses, points shaft bearing bore. 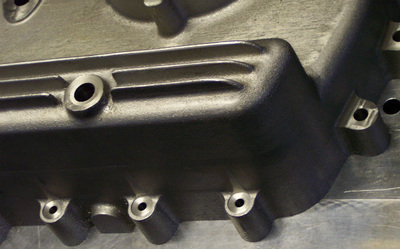 Camcover top- ignition housing, oil filter cavity, oil feed holes. Oil pump cavity 1. 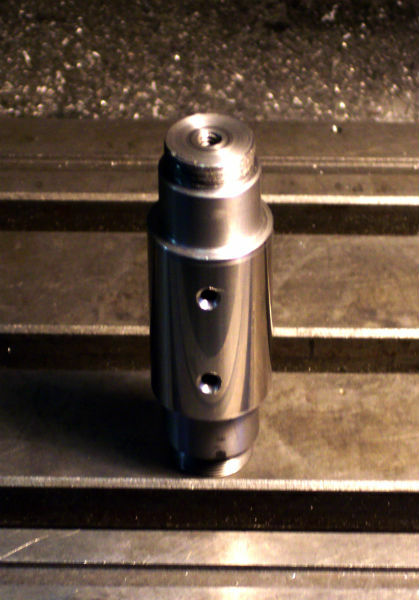 Deep spindle hole drilled, reamed. Critical accuracy. 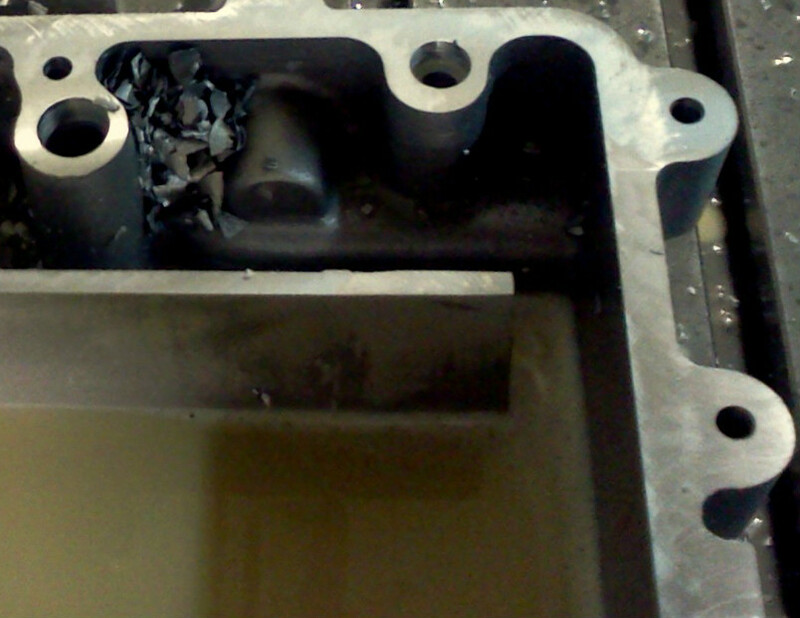 Oil output hole to heads. 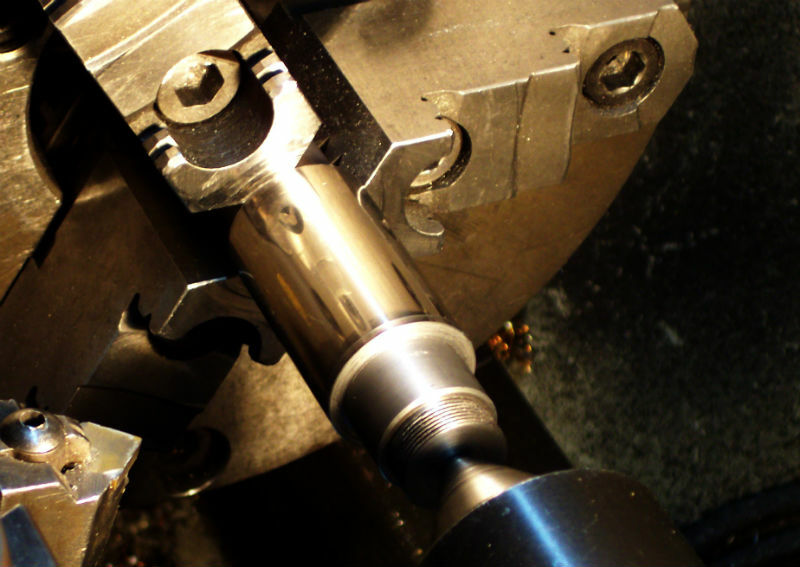 Drilling, tapping. 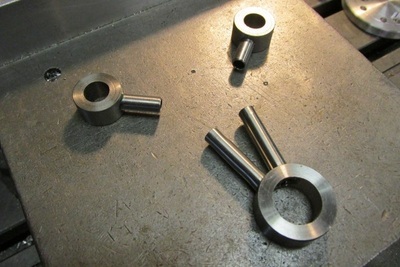 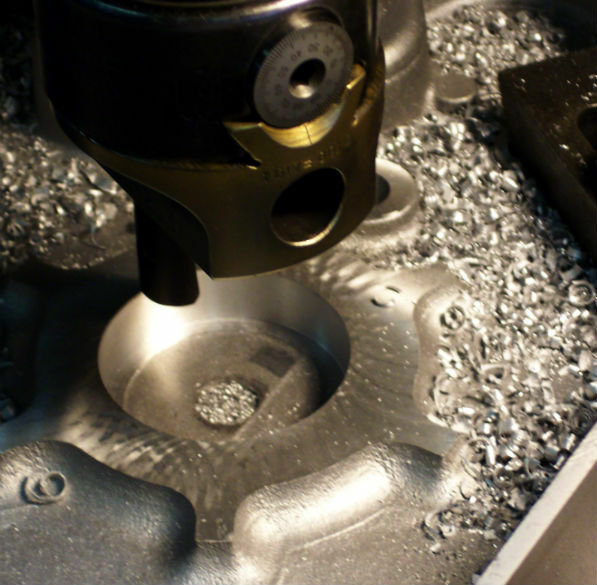 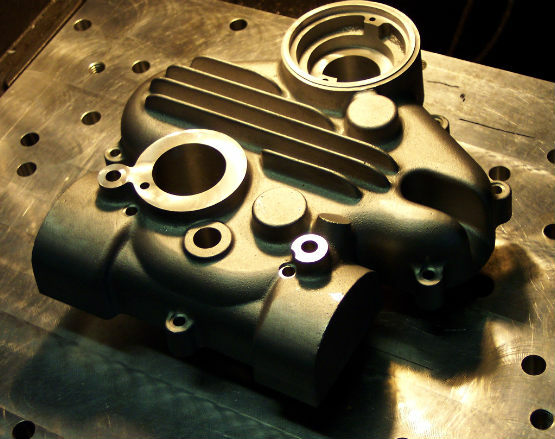 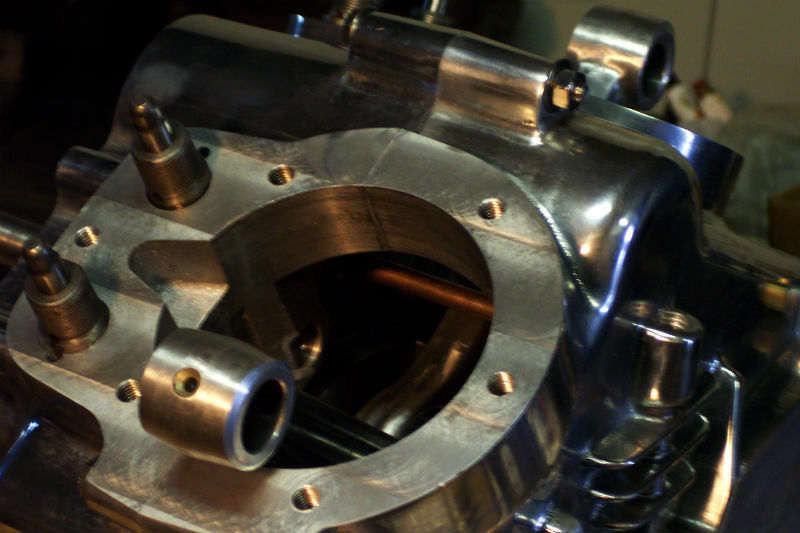 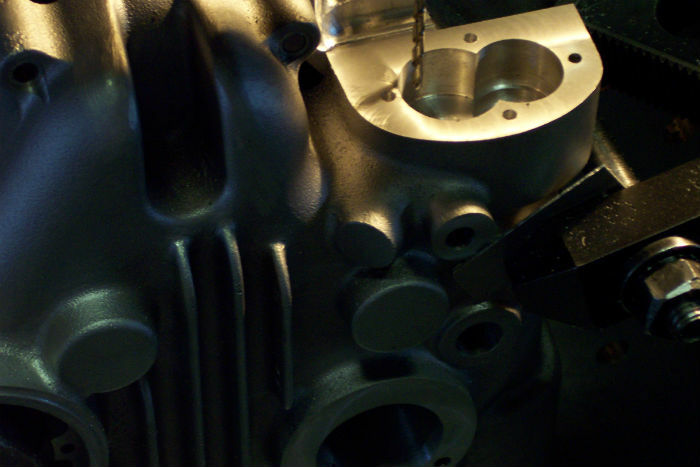 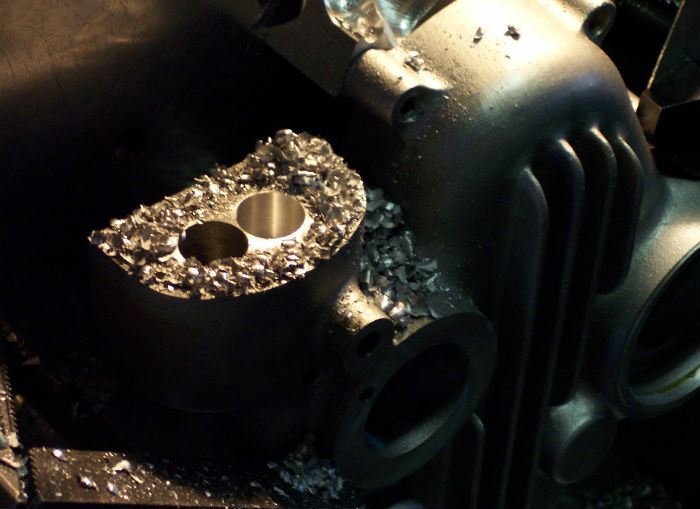 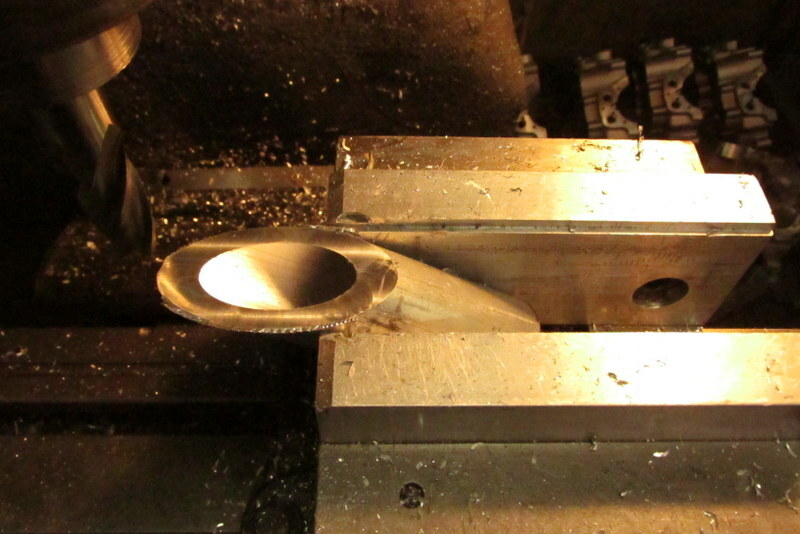 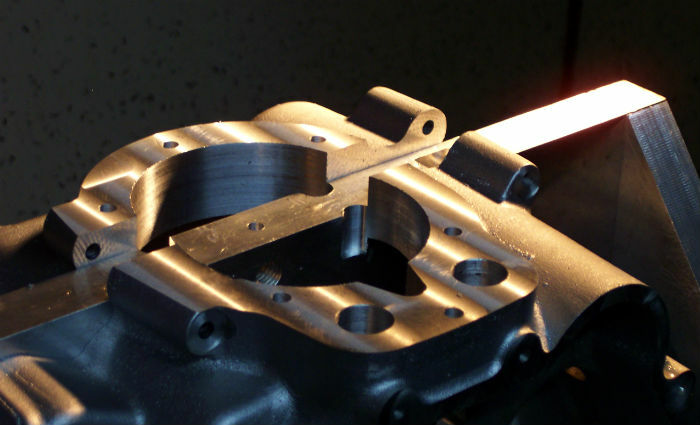 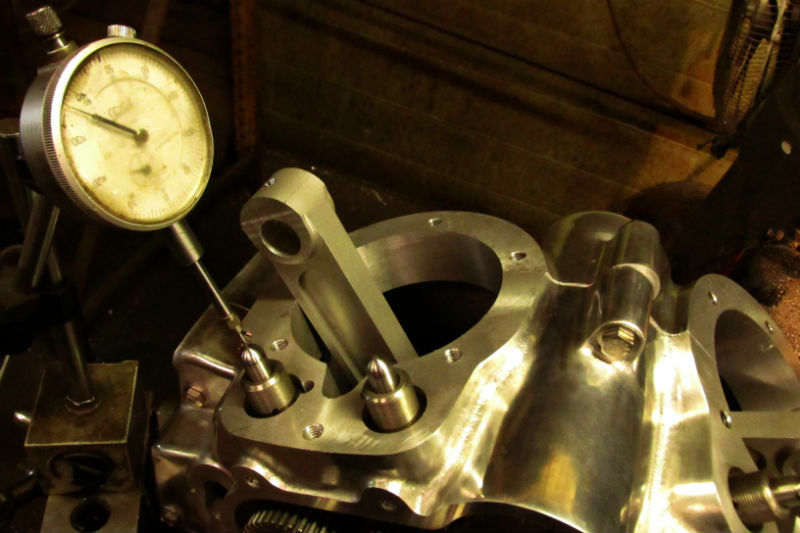 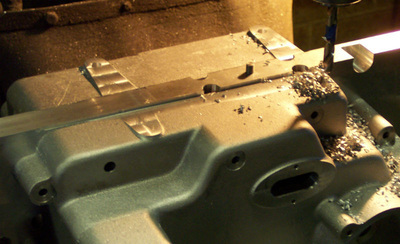 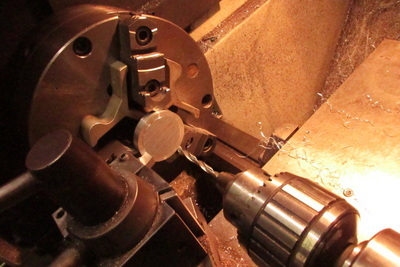 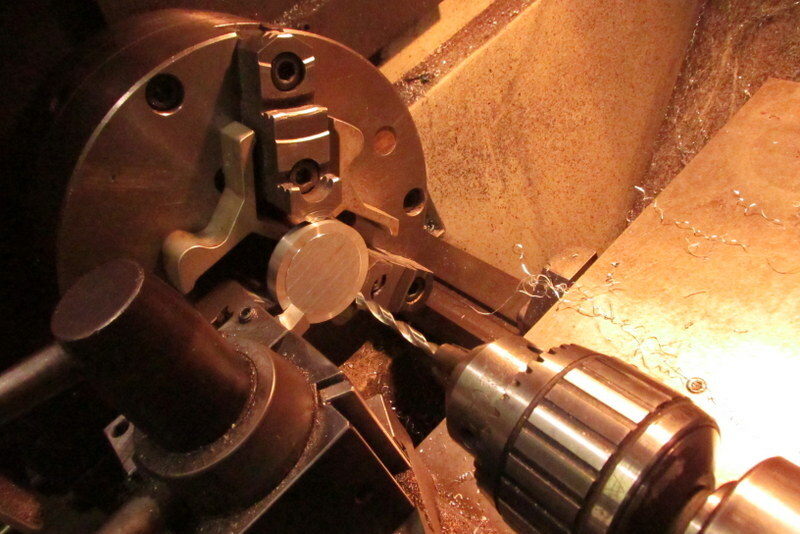 Case halves machined as pair for rear cylinder mouth. Drill, tap for studs, drill, ream for tappet guides. 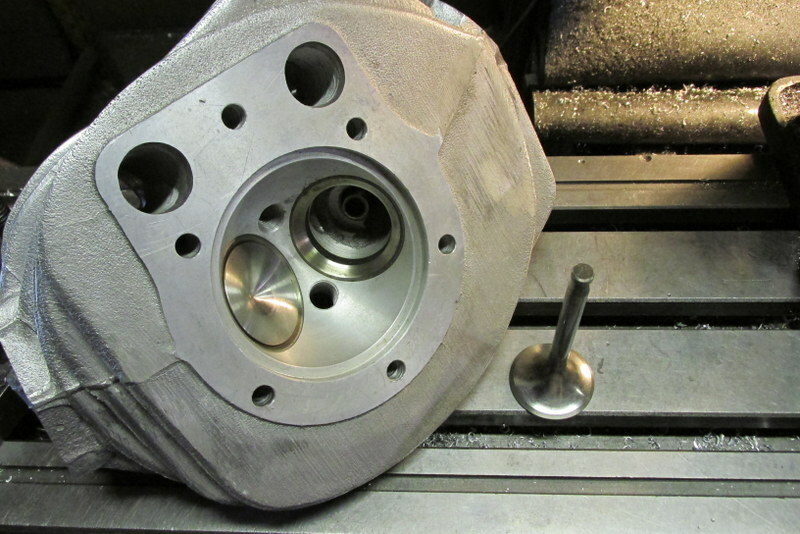 Rotated for machining front cylinder mouth. 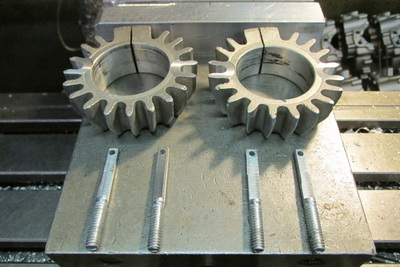 Cases rotated for facing, drilling, tapping gearbox mating surface. 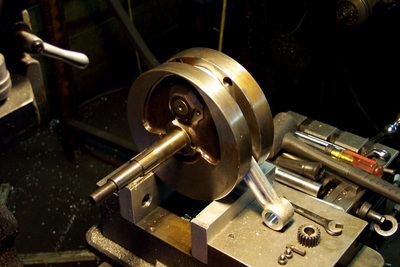 Drilling oil gallery for drip feed to drive-side main bearings. 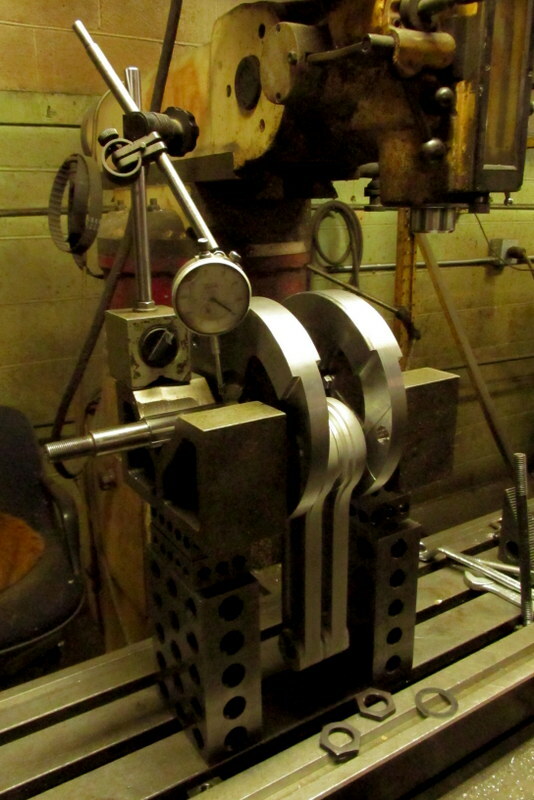 Line-boring timing-side main bearing bore. 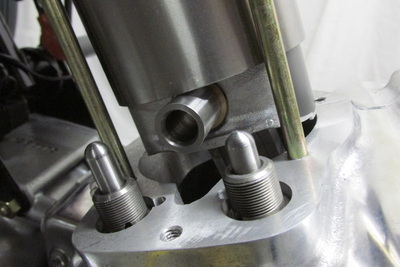 Line-boring driveside main bearing bore. 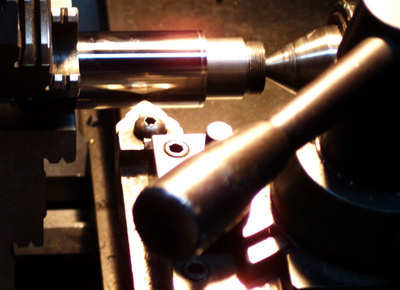 Lathework. 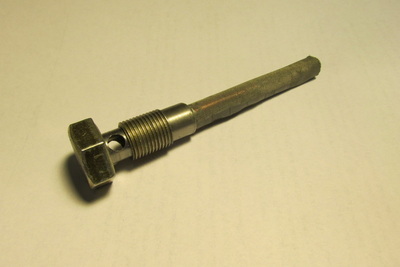 Custom crankpin. 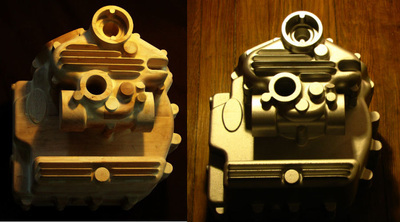 OD and shoulders turned. 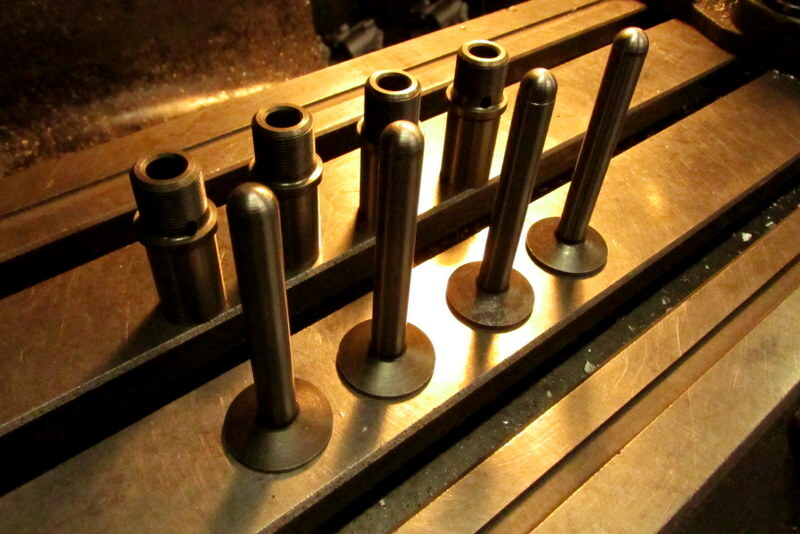 Oil feed holes drilled, chamfered, threads cut. 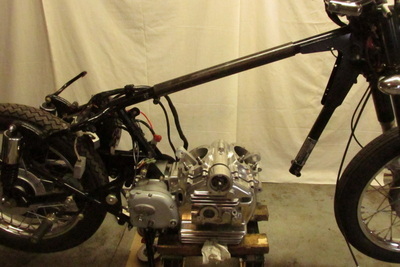 Donor crank removed from engine. 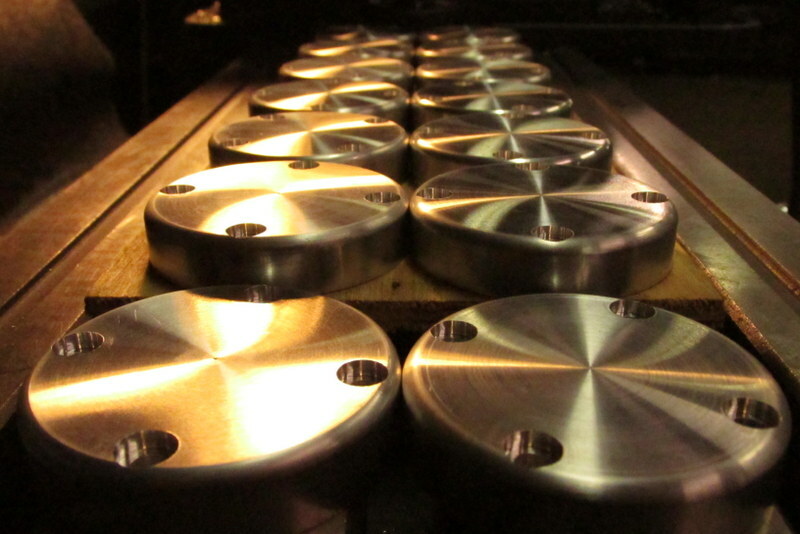 Machined flywheels ready for assembly. 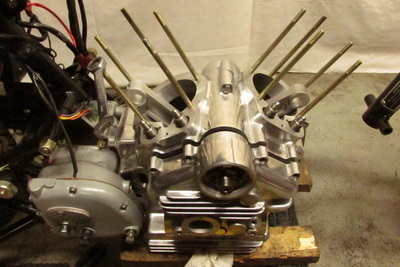 Crank assembled, trued, checked for runout, around .001". 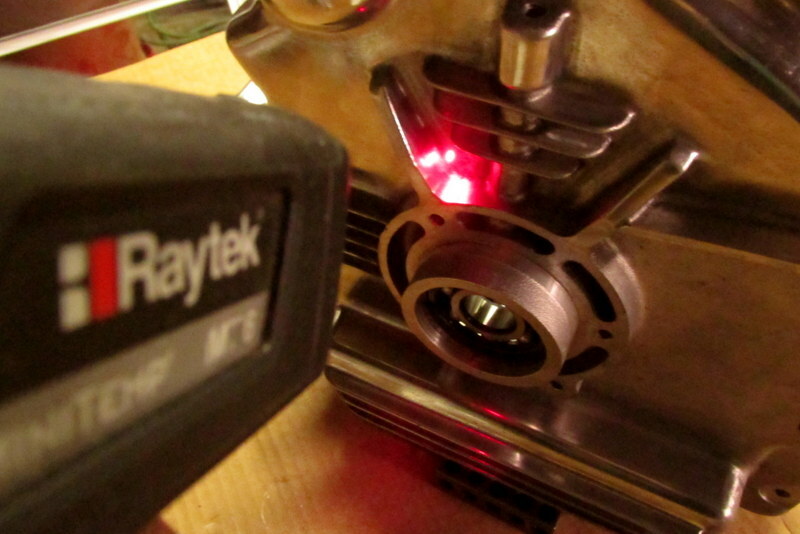 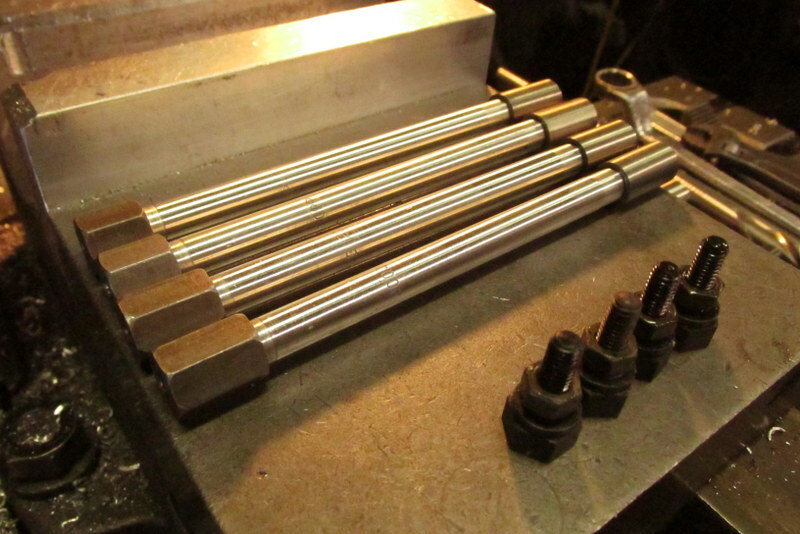 Tappet guides and tappets shortened and machined to allow easy stock jug fitment. 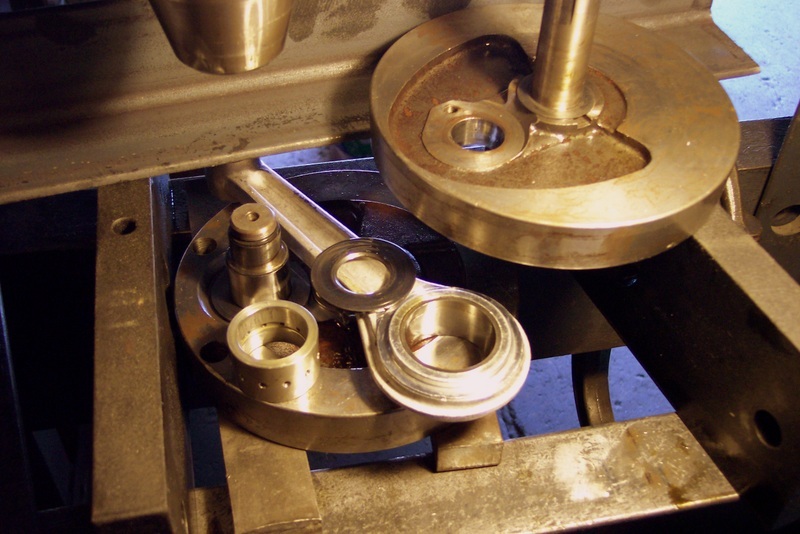 Correct ball ends machined on tappets. 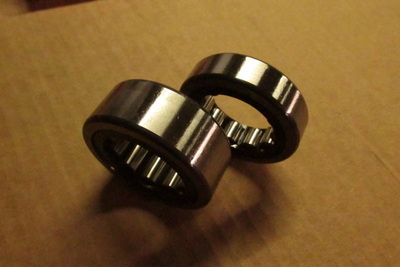 New FAG main bearings. Drive side 2305, 41% wider than stock. 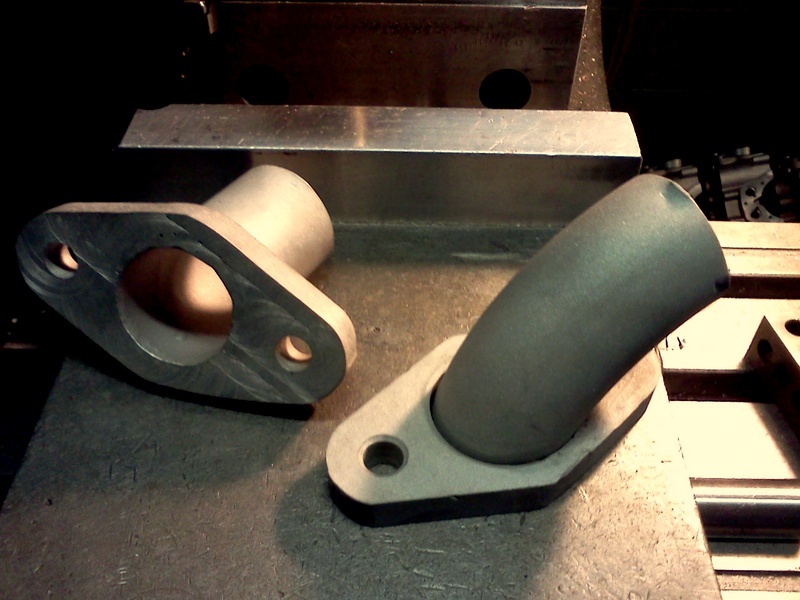 Timing side 305, 62mm, vs. 52mm stock. Musket driveside roller bearing on left. 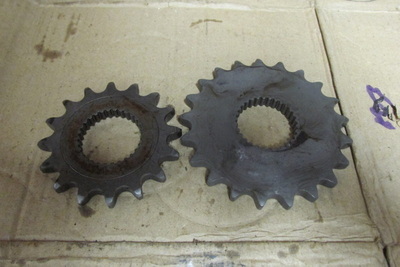 Compare to stock roller on right. Cases heated for bearing and component pressfit. Timing shaft oil seal installed. Crank installed, case halves buttoned together. 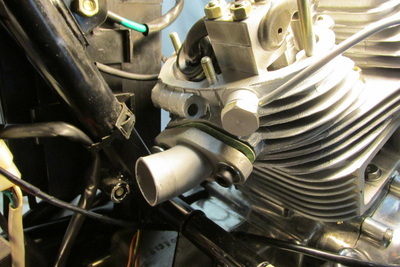 Note oil feed pipe from timing-chest to main bearing drip-feed. 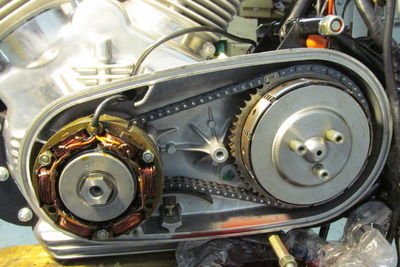 Cam timing done with dial indicator. 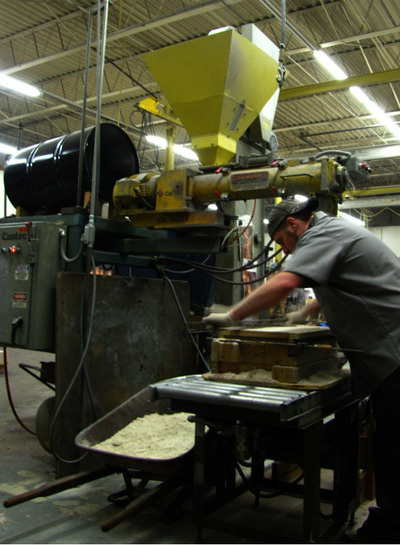 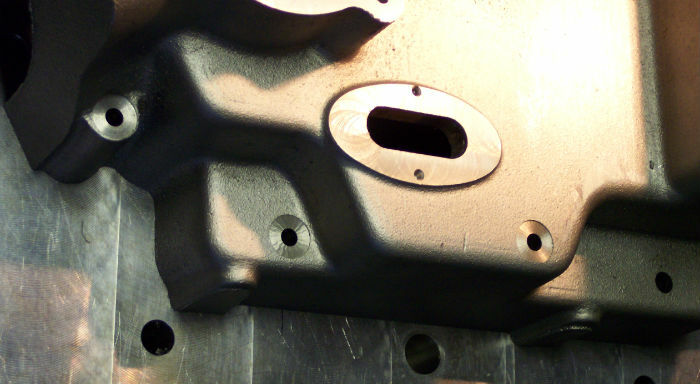 Oil filler neck mating surface machining. 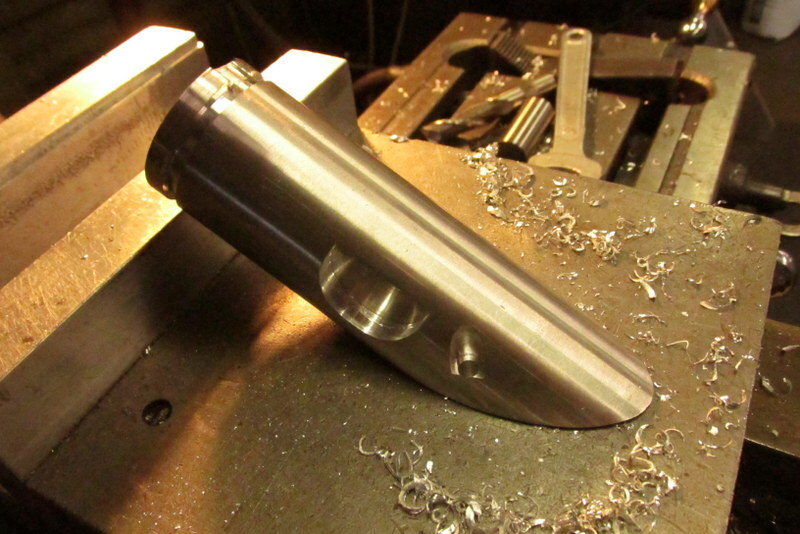 Oil filler neck done. Slot is for 5-speed gearbox protrusion. 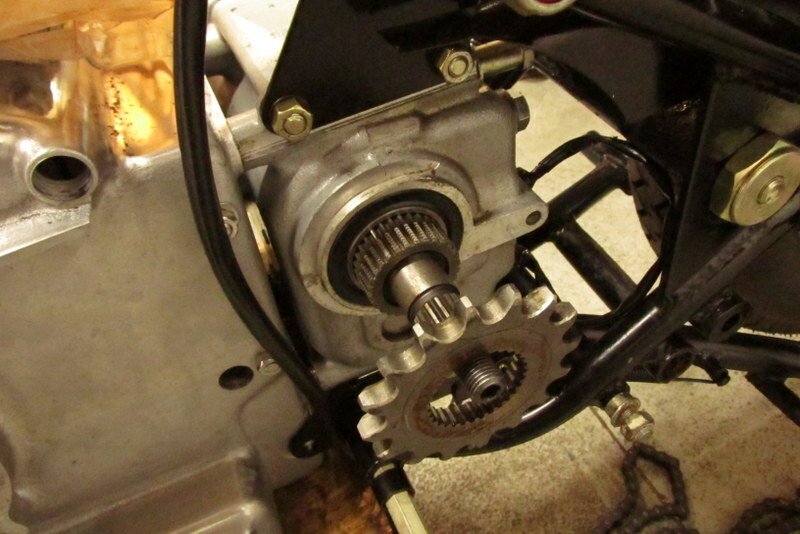 Sealed bearings for ignition shaft installed. Oil pump disks re-surfaced for better sealing. 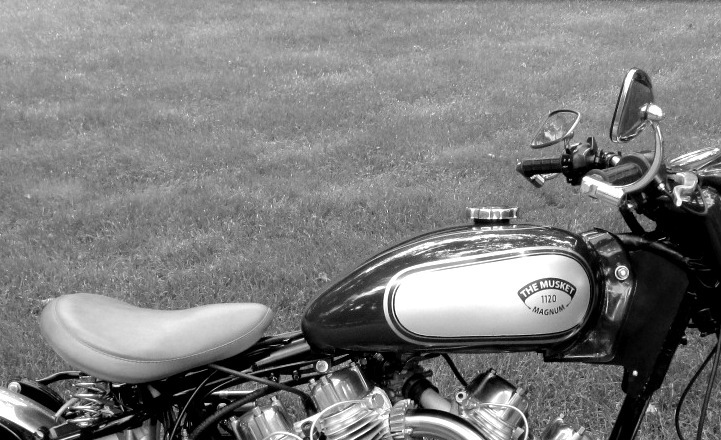 Observe reflections. Oil pump components ready for installation. 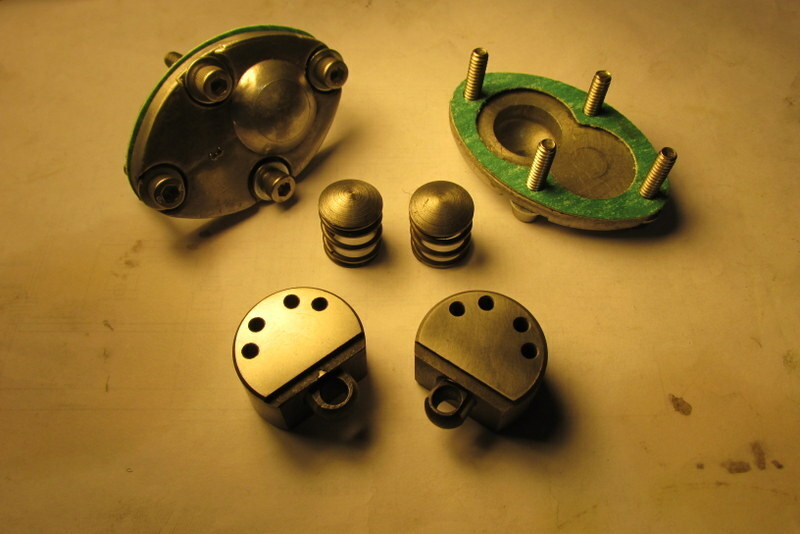 Sump-to-pumps oil line fittings fabricated, stainless steel. 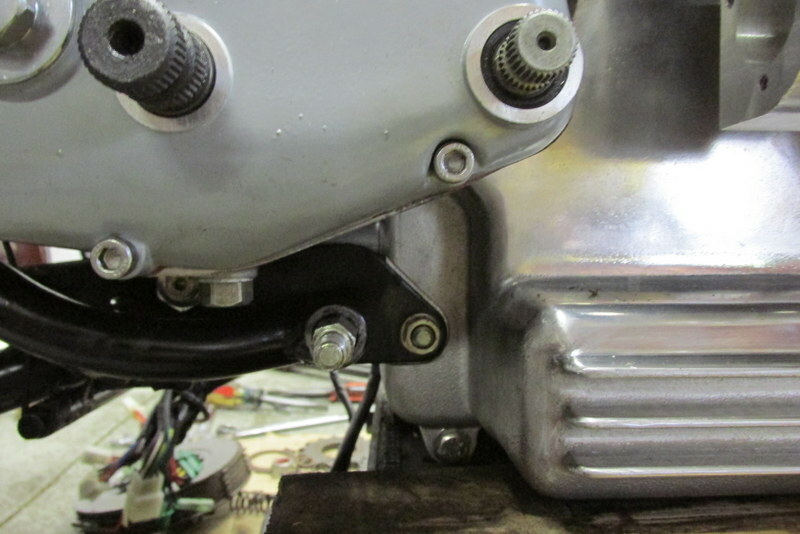 Custom sump oil pickup banjo bolt with fine mesh-screen. 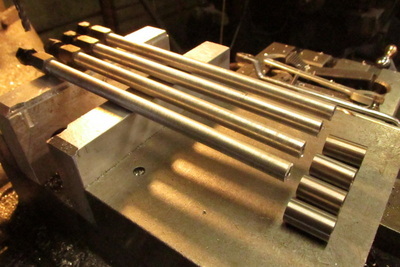 Musket bottom end can now be mounted into frame. 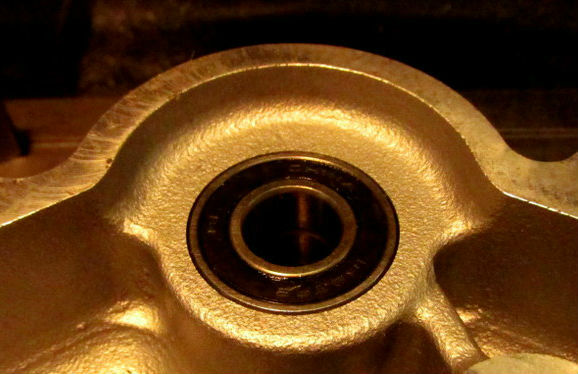 Gearbox stud nuts tight, crankcase secured. Topend installation begins. 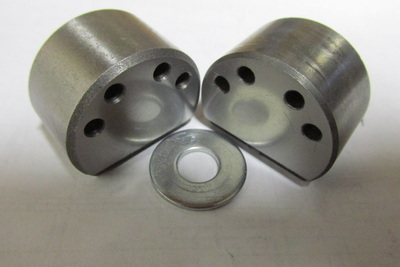 Cylinder studs. 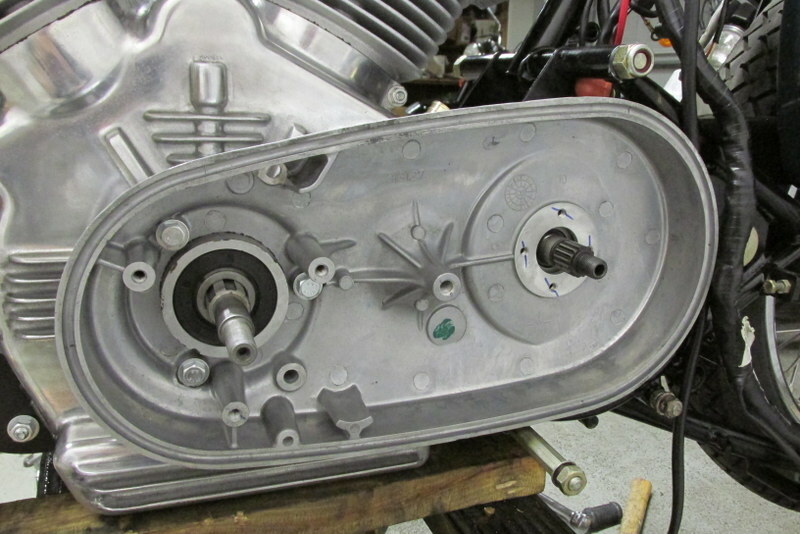 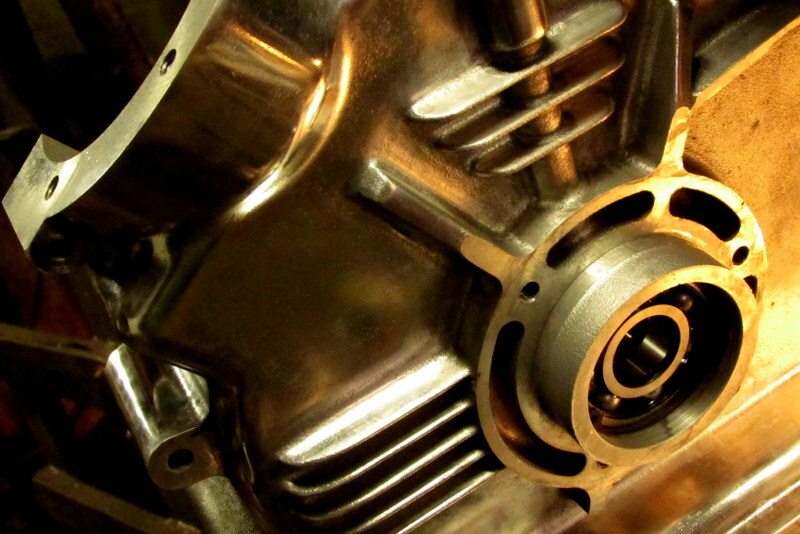 Note crankcase rear mount hole is same position as stock, fits rear plates. 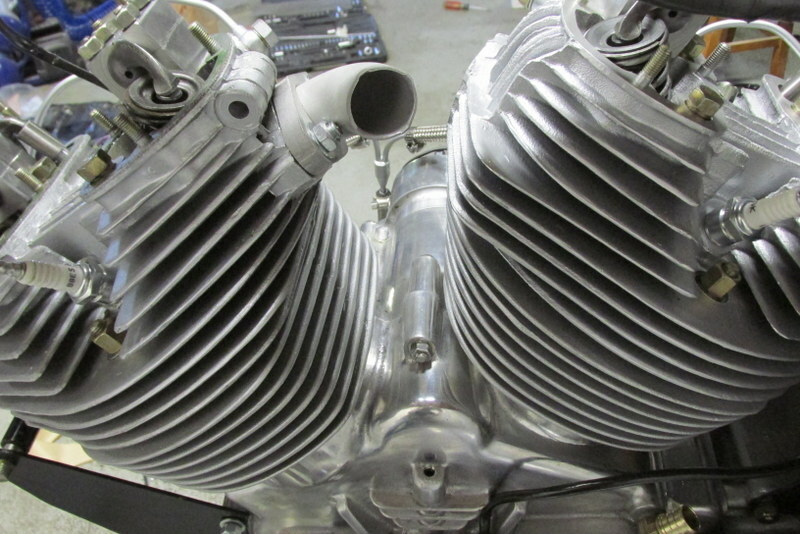 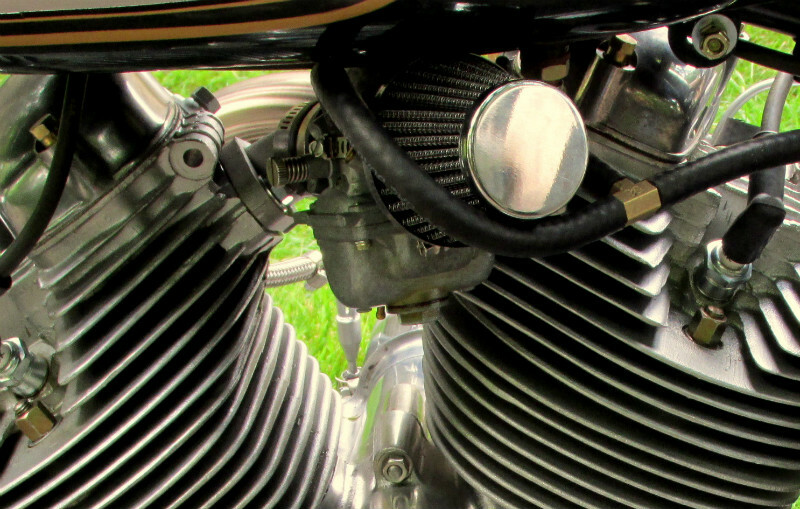 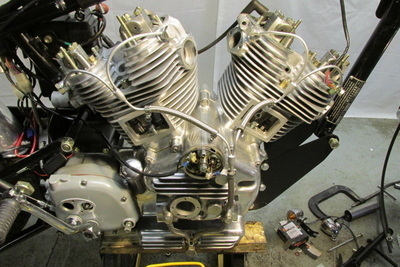 Piston and rings, pin in rod, cylinder lowered. Base gasket not shown in pic. New cylinder head for second cylinder. 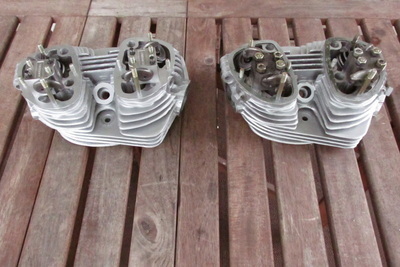 Cleaned, degreased heads, coated with high-temp. 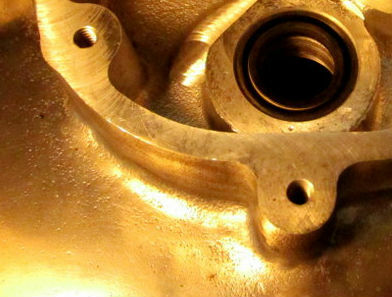 'cast-alum' engine paint. Frame stretch tube positioned, cross-holes drilled, bolted. 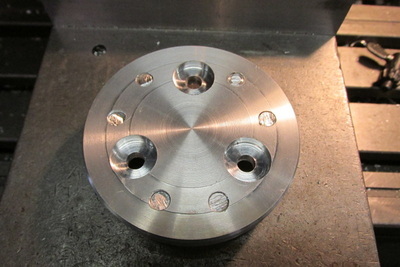 Can be welded also. Custom front engine mount plates installed. Stock pushrods need to be shortened. Rocker ends cut. Ends pressed onto shortened pushrods. Oil filter covers getting faced, radiused, drilled. 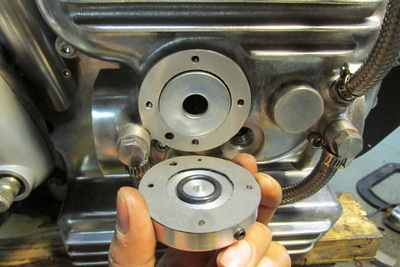 Oil filter covers, holes drilled, counterbored. Oil filter in, cap ready to fit. Oil lines to heads installed. 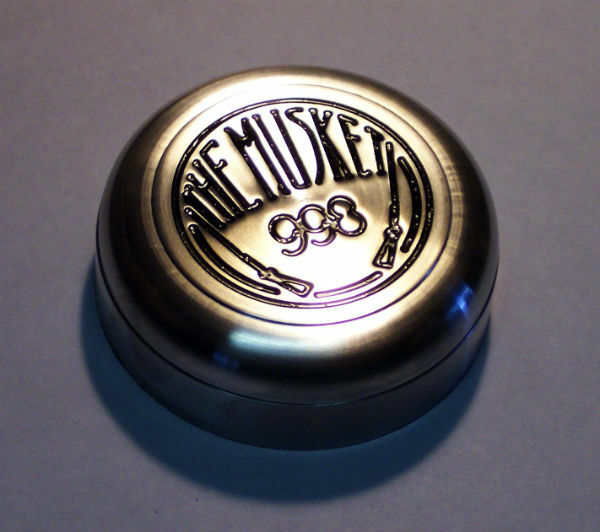 Custom ignition cover machined and engraved from 6061 billet. 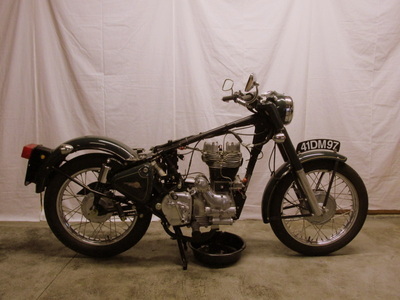 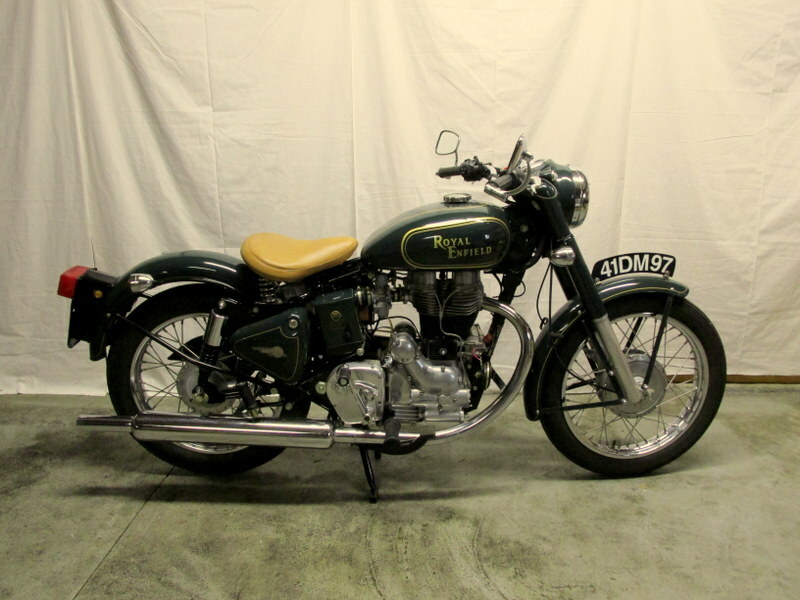 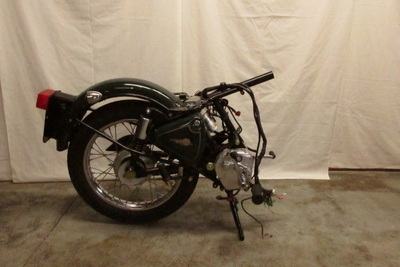 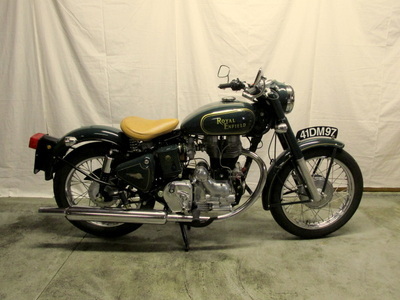 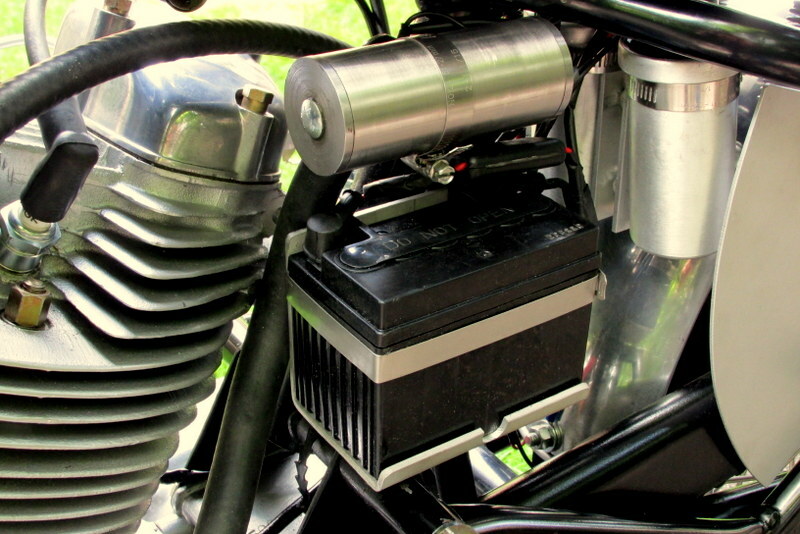 If bike is electric start, new kickstart inner primary will be provided (extra). 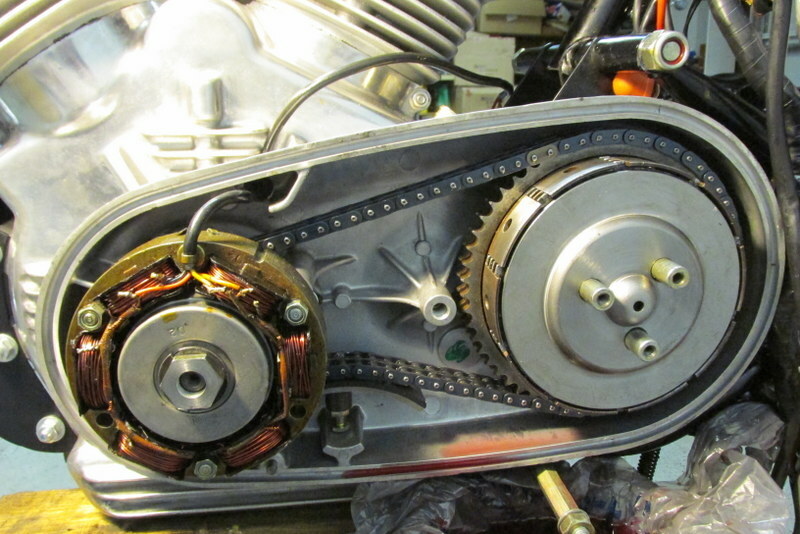 Engine sprocket, alternator, rotor, clutch installed. Custom 9 spring clutch cap gives 50% greater pressure. 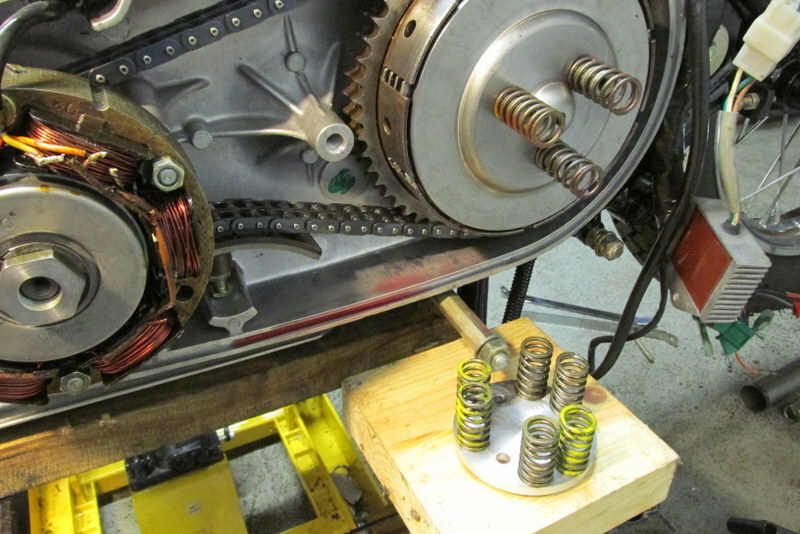 Soft/hard springs to adjust. 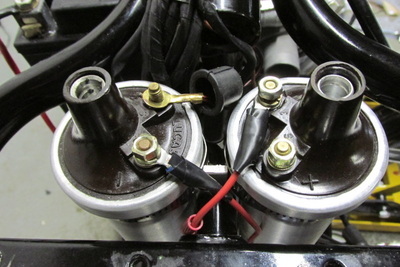 Twin coils get wired into harness. Coils under seat or behind gearbox dep. 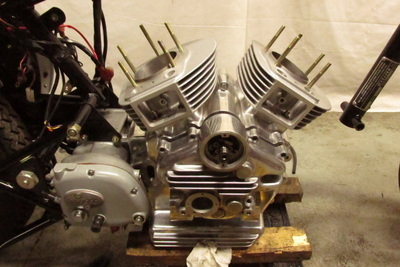 on 5spd/4spd box. 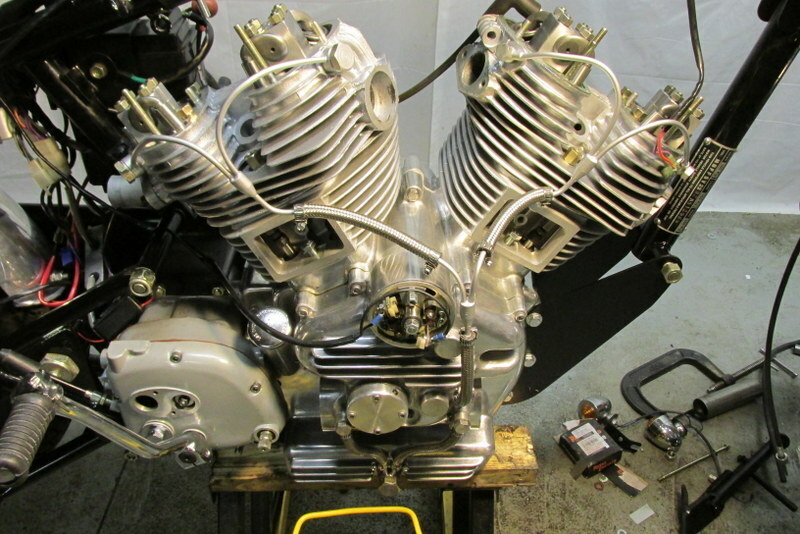 Twin ignition points wired in. Custom curved intake manifolds made. Front manifold installed. 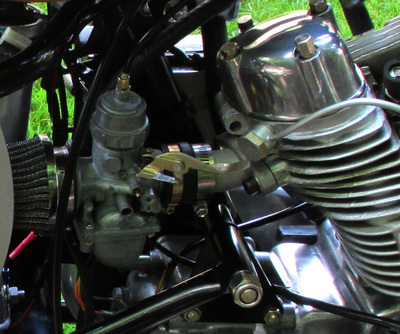 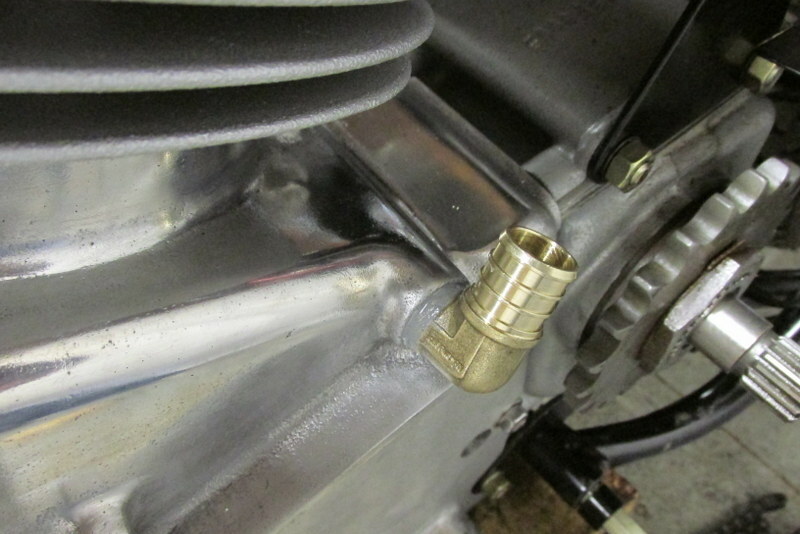 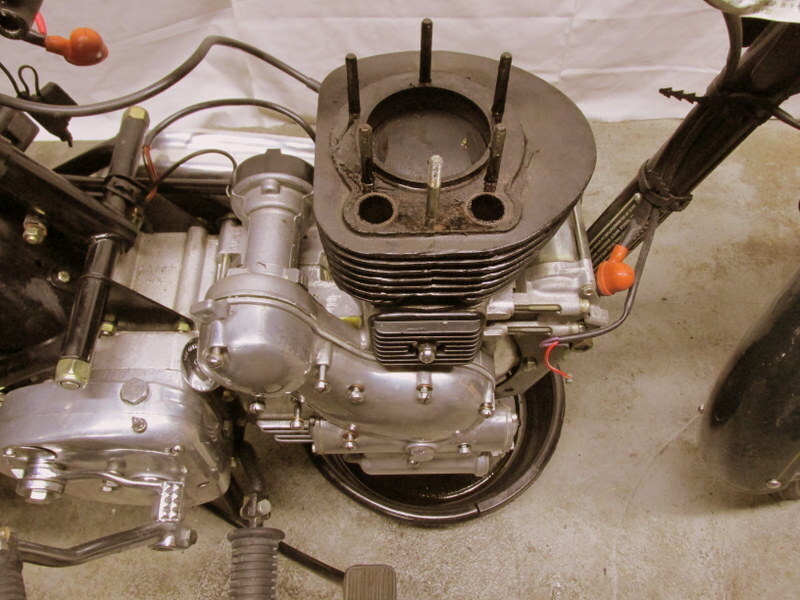 Front carb is a tricky fit under tank - gap between tank tunnel and toptube used for cable. Front carb and filter on. 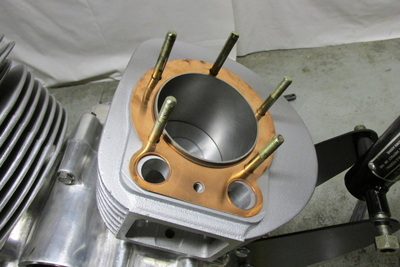 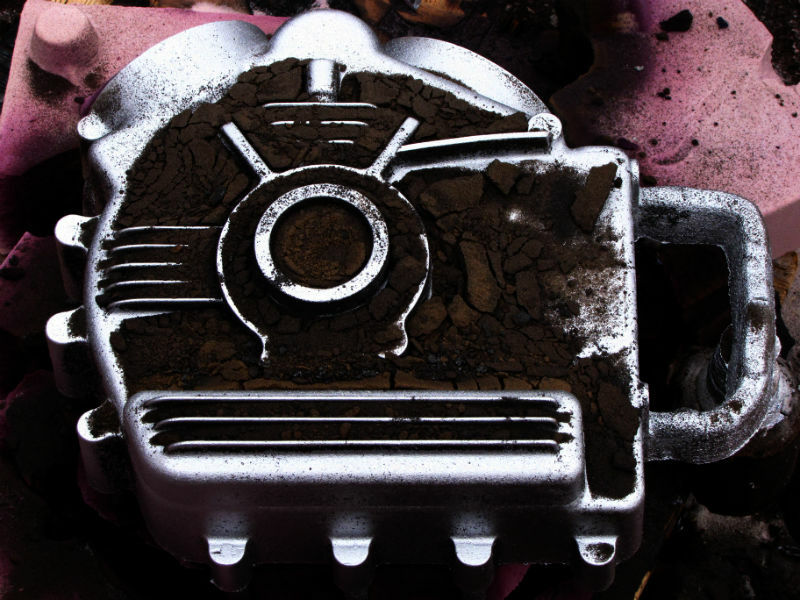 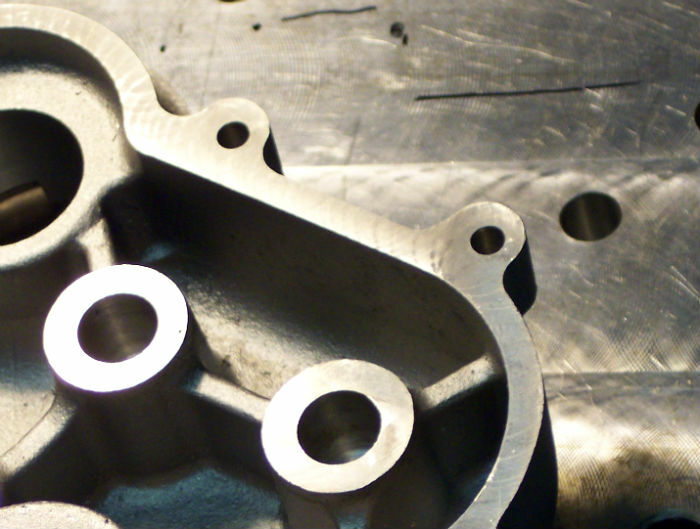 Stock carbs need re-jetted for pod filters and free-flow exhaust. Rear carb and filter. 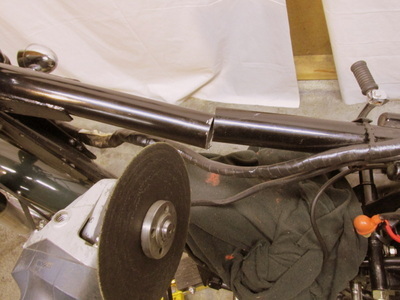 Note: stock rear mudguard may need filter housed in toolbox. 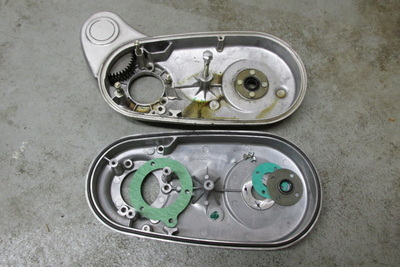 Oil catch-can. 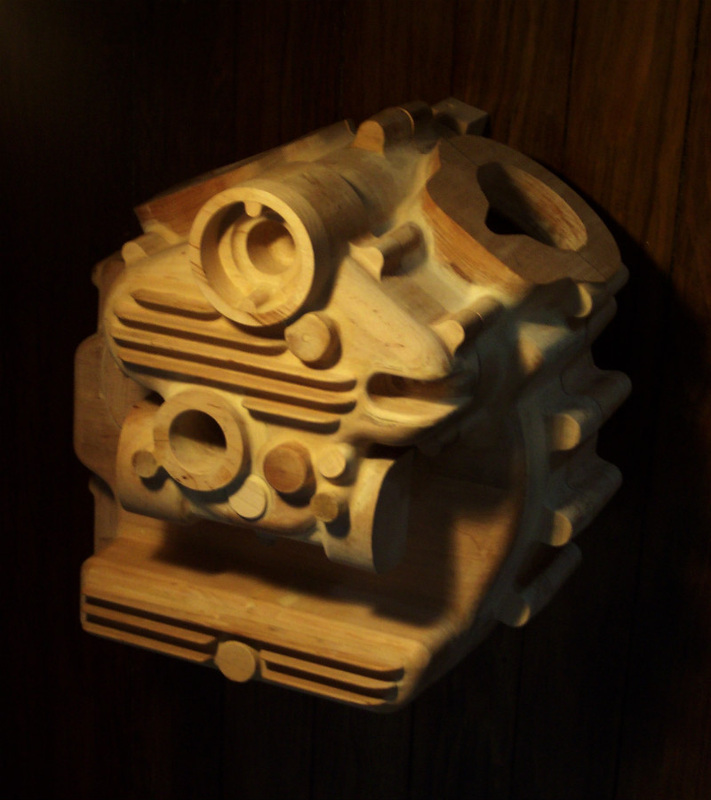 Can be mounted under seat on 4spd bikes. 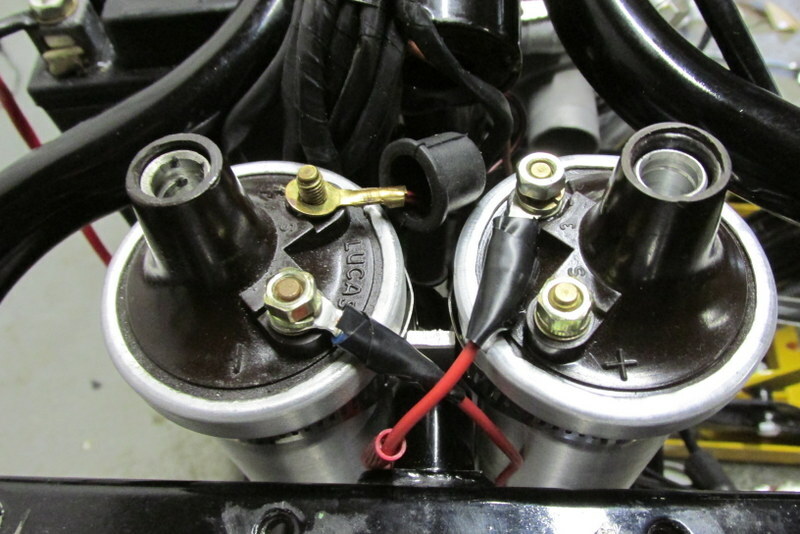 High location allows oil drain-back when engine is off. 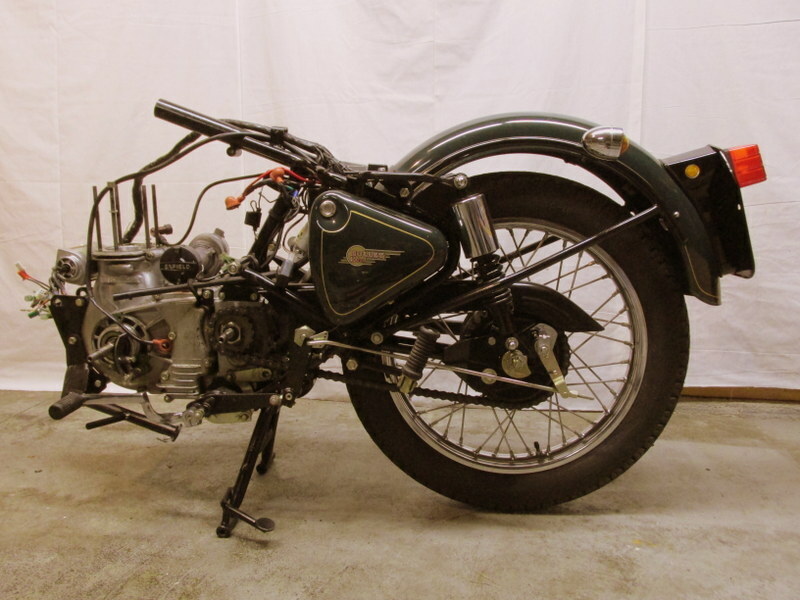 Gas-tank moved backwards, seat moved forwards to compensate for frame-stretch. 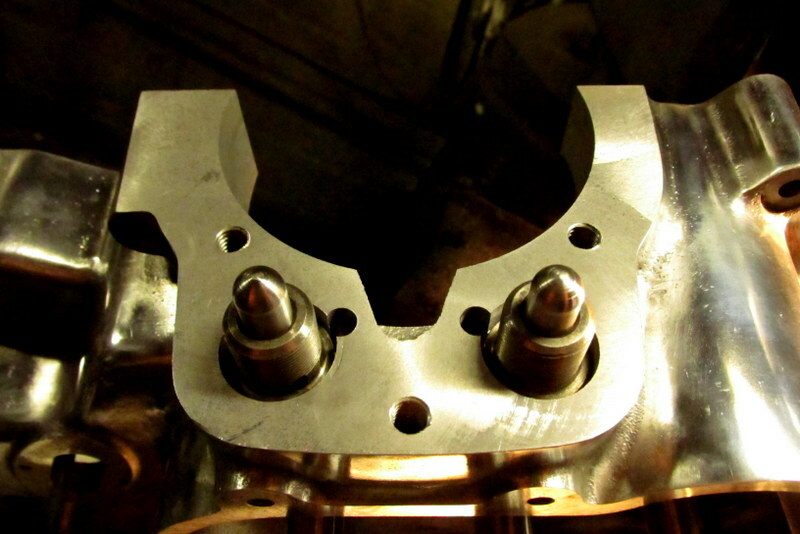 Coverplate made for headstock to hide gas-tank mount hole. Exhaust cooling rings machined to accept studs, installed with dowels in head to secure pipes. Custom exhaust fabricated from mandrel-bent stainless.